Can we be certain that Trump wont call on his deeply committed and well-armed supporters to take to the streets to overturn an illegitimate victory by America-haters? Yeah...keep getting yourselves worked up over your fantasies. Pretty soon your sphincters will just give up and you can wallow in your own crap for real. These people are simply awful. On the off chance that Trump is defeated in 2020 then yes, I expect he will leave office gracefully. I give Bill Maher credit for being a total jerk. I can't wait until the MAGA Kid's lawyers hit him with a fat multimillion dollar slander lawsuit. How pathetic...it was Hillary that said that not accepting the election results would “be horrifying” and then her and her cronies started all this collusion crap to try to overturn the election...they always ‘worry” about crap they do and fantasize that it’s not therm doing it. Author is STILL butthurt that Hillary lost. Did Algore Junior go away? But this time do you think they just really have CONVINCED themselves that he is hitler incarnate? Besides the fact that he is very pro Israel. And is nothing like hitler. In any way. If November 2016 was traumatizing, what will happen in November 2020 when Trump wins a second term? If we don't find a way to derail the RAT fraud machine that may not be an issue. What he wont do is steal the furniture and sabotage equipment like the Clinton people did. You’re right - the very next day Rush was playing a clip of Joe Lockhart on CNN saying the same sort of thing - that Trump will send tanks rolling down the streets to stay in power. 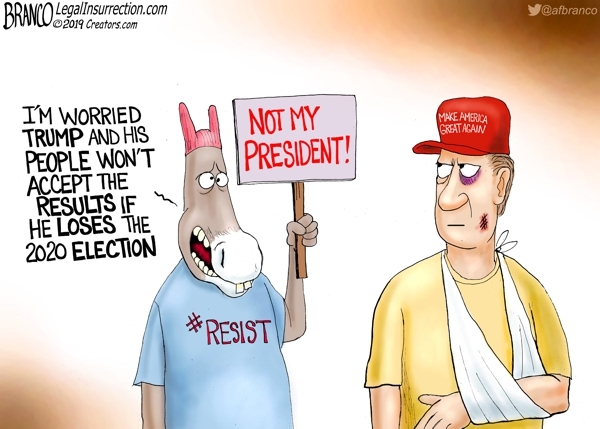 Apparently this is now their new current narrative of why the President is so ‘dangerous’ to leave in power. Collusion fell apart...so they’re trying something new now.